Kim Blake was born and raised in the Toronto region. She completed a Bachelor of Science degree from the University of Guelph in 1992 and graduated from the Ontario Veterinary College in 1996. 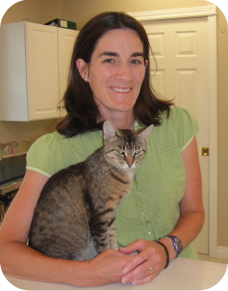 Kim joined the Stirling Veterinary team upon moving to Belleville in 1997. She enjoys clinical medicine and education. Kim has held a teaching position for specific veterinary technician courses at St. Lawrence College in Kingston, ON. She has also made numerous presentations to younger students at public schools and churches about veterinary medicine. Kim enjoys public interaction so much she has been a guest volunteer on a few radio talk shows to discuss people and pets. Professionally, Dr Blake is a member of the College of Veterinarians of Ontario and the Quinte District Veterinary Association. She is also a member of the Ontario Veterinary Medical Association on which she has held a position on the board of directors. On the home front, Kim has her days full with her husband, 2 children, 2 cats and a dog. She enjoys volunteering weekly at the local public school. When time allows, Kim enjoys long distance running. Her proudest accomplished includes qualifying for and completing the Boston Marathon in 2010.